Abba Father, I come to You in the wonderful and majestic name of my Lord and Savior Jesus Christ. I thank You for the new mercies that I see each and every day. Thanks for the honor and privilege You have given me to come before Your glorious throne of grace, where I can obtain mercy. I give You all the praise that is due to Your name, Oh Lord. Thank You for the many blessings You continue to bestow upon me. You are the great I AM, the ALPHA and the OMEGA. You are the BEGINNING and the END! Father God, as I continue to give You all the glory, I declare that I will bless Your name at all times. Your praise will continually be in my mouth. You are my refuge and my strength, in You I have my being. Hebrews 4:16 Let us therefore come boldly to the throne of grace, that we may obtain mercy and find grace to help in time of need. Exodus 15:2 The LORD is my strength and song, and He has become my salvation; He is my God, and I will praise Him; My father’s God, and I will exalt Him. JEHOVAH RAPHA, my HEALER, I glorify the matchless name of Jesus Christ. I declare that every stronghold over my life is broken. Every high thing that exalts itself against the knowledge of God is torn down and cast into the sea. Every mountain, Lord, is removed through the working power of the GODHEAD (the Trinity) – God the Father, God the Son and God the Holy Spirit. I command all sickness, all diseases, all pain to leave my body right now, in the name of Jesus Christ! I declare healing. Heavenly Father, You are my HEALER and at the sound of Your name, every knee shall bow and every tongue shall confess that Jesus Christ is Lord over all the earth. I decree and declare that I hunger and thirst for Your healing touch Lord and that rivers of living water will flow through my veins, my arteries and my blood. By the BLOOD OF JESUS CHRIST I am healed! I am delivered! Thank you Lord, I am set free! I AM ETERNALLY RELEASED! Matthew 4:4 But He answered and said, “It is written, ‘Man shall not live by bread alone, but by every word that proceeds from the mouth of God. Isaiah 53:5 He was wounded for our transgressions, He was bruised for our iniquities; the chastisement for our peace was upon Him, and by His stripes we are healed. Father, Your Word declares that man shall not live by bread alone, but by every word that comes from the mouth of God. I believe that as I continue to trust and have faith in the power of the Gospel of Jesus Christ, I will see the manifestation of Your healing power. Since the body cannot go where the mind has not gone, I will look to the future and see my victory. All these mercies I ask in Your name, I claim it and I receive it! SO BE IT! AMEN and AMEN! Heavenly Father, We thank You for Jesus Christ, our Lord, Savior and Mediator. He is our Great Physician, Healer of all diseases and Comforter in all afflictions. Lord Jesus Christ, we call upon Your blessed name and we offer our brother/sister, who is suffering with pain on his back. Look with favour upon Your servant, Lord, who remains in faith and prayer and in confidence that You will come and renew him in body. Free him from all aches. We pray and we ask You, Lord, to be there with his doctors as they suggest methods to ease his pain. Touch him with Your healing hands. Fill him with Your Holy Spirit to bear with Your perfect timing in healing. We pray for his wife and children, that they may understand his time of pain and understand his moments of not being able to help with home affairs. As pain can affect a person’s emotions, we pray that he be guided in Your perfect love and in Your spirit to be calm, ever trusting in Your healing power and in Your restoration. Amen! I am praying for this foul disease cancer to permanently go away from my body. I command the foul cancerous cells to wither, die and be killed at the roots permanently along with this horrible pain from this foul disease cancer in my body, from head to toe, inside and out, never to return. In Jesus name I pray, Amen. Praise God & Thank God for my permanent healing from cancer with full restoration. “By his stripes I am healed“. 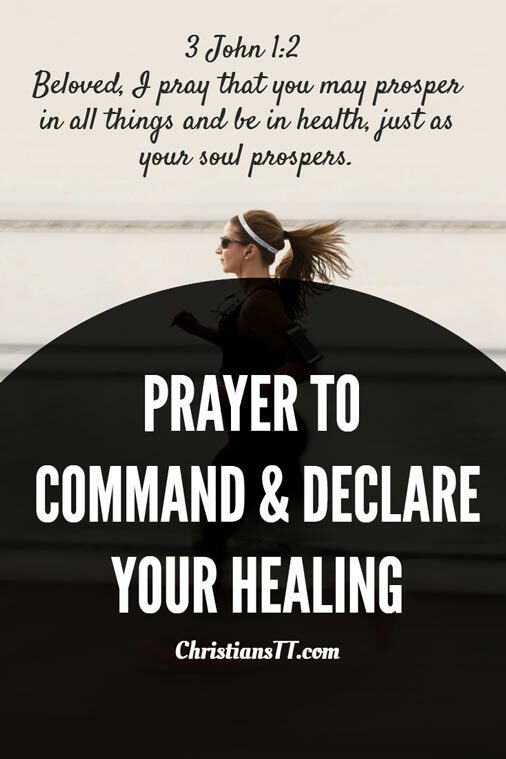 Heavenly Father, we come to you humbly asking for healing Lord. We know you have our days out in front of you and Lord what would take a doctor years to heal, you can do it in seconds. So Lord, we bow our heads right now and ask you to touch us, from the crown of our heads to the souls of our feet lord. Speak healing right now Lord. We plead the blood for healing, in the name of Jesus Christ we pray, Amen. You (insert name) are special and you are truly loved by God and myself. I plead the blood over your life. No weapon formed against you shall prosper. I decree over your life, in agreement with the word of God that says We shall decree a thing and it shall be established in heaven. In the name of Jesus, receive your healing as the word of God is being manifested in your body, in your cells, in your organs and systems.